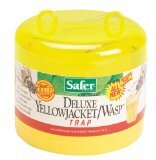 Safer Deluxe Jacket Wasp Trap .. Product weight is 0.42 lbs. s="h3color tiny">This review is from: Safer Deluxe Jacket Wasp T.. This is worth the $10 this thing can catch a good 50 - 100 hornets, yellow jackets ect before you have to change the atractive sent. This is awsome especially if you don't know where the hive is. The only bad thing is if the sent gets on you it smells really bad and may take a day or so to get it off.